Roll forming: A Cost-effective Parts Manufacturing Process - ZhangYun Machinery Manufacturing Co.,Ltd. Narrow profiles: these are products with open or closed seamless section with no repetition of a waveform. This category includes, among others, structural sections, cable trays, guard rails, etc. The most important asset of profiling, compared to folding, is its high production rate. 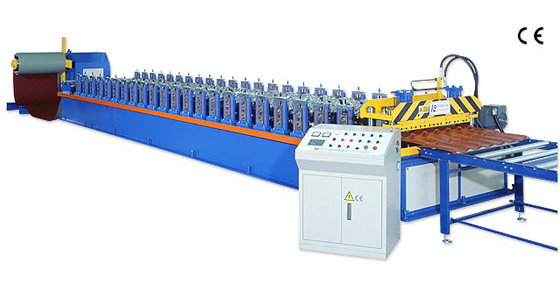 The biggest restriction of roll forming is the fact that the product must be of a constant shape in its length - which does not exclude curved products. To avoid cracking of the coating and corrosion of the profile, when using it in the future, choose a geometry of the profile with the lowest possible e / R ratio: with large radii relative to the thickness of the material. The main difficulty in profiling is to properly manage the twisted areas of the sheet in the profile use. These are intrinsic to the process. It is not a question of eliminating them - which is totally impossible - but of limiting them or even, in certain cases, of distributing them correctly. It is necessary that the longitudinal deformations caused by the kinking of the sheet in the profile use remain in the elastic domain of the material. If this is not the case, the material will laminate. The sheet will locally extend irreversibly in its longitudinal direction and twist at the exit of the profile use.